Veena or Vina is seen in the hands of Sarasvati and Veena Dakshinamurthy (Shiva). Ravana and Agastya were very good Veena players. I have already given the story of a competition beween the two. Narada, the inter galactic traveller,was the greatest Veena player.Demon Ravana has Veena on his flag. Veena is found in the Rig Veda and thee Atharvan Veda. But in the 2000 year old Sangam Tamil literature we dont find Veena but Yaaz. Yaal is similar to veena, a string instrument. Veena figures for the first time in Post Sangam work, Silappadikaram,the most beautiful epic of the Five Tamil Epics. 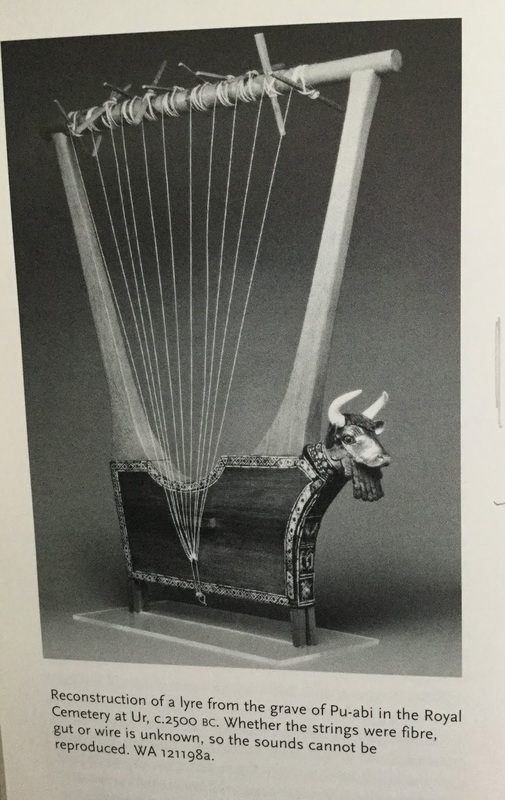 Yaal or Yaaz is similar to lyre and harp. Did Veena become Yaal (Yaaz) or Yaaz become Venna is a debatable point. Alternately they might have evolved simultaneously because we find wind instruments, string instruments and drums all over the world. Even he Australian aborigines invented their own unique musical instrument. My research shows that the seven notes went to Greece, Sumer and other parts of the world from the Hindu scriptures. Tamils also speak of seven notes with special Tamil tecnical terms. Since the seven notes are found in the Rig Veda, the oldest book in the world, it should have spread to other parts of the world fron the Vedic land. There are supporting evidences in the Vedas. They talk of different musical instruments and they formed part of the main Vedic rituals. Vaanan a musical term became Banan in Tamil (B and V are interchageable as we see in Bengal= Vanga in Tamil aad Sanskrit; even in ancient Tamil we seethis B=V change. Bandi was cart in Sangam Tamil; now Vandi is the modern Tamil word for cart). I can give innumerable examples. Vanan= Banan change is an important one. Throughout 2000 year old Tamil literature we see Banans (bards) singing the praise of Tamil kings. Greek God ‘Pan’ (god of the wild and Music) is also a cognate word to Banan and Vanan. Now the question is how did Yaaz or harp or lyre disappear and only Veena survived. The strange thing is until fifth century CE we see only Yaaz in Tamil (except one refrence in Tamil epic about ‘Naradar Veenai’ in Silappadikaram); but after fifth century we see only Veena and not Yaaz (harp or lyre). The starnge thing about this harp or lyre or Yaaz is , it is seen in Gupta scultures and Gupta coins. Slolwly it disappeared from the scene. Even today Yaaz is seen in East European countries. I took a picture of harp player in South Kensington, London where a lyre player was playing the music in the street. I got a similar picture in social media from Croatia. Why did this disppear and yield to Veena in India is a subject for research. Now let us look at the Tamil Yaaz. We have refrences to several types of Yaaz from 7 to 1000 stringed instruments. The commentators of the Tamil epic gave all thse details about them. Swami Vipulananda was one of the scholars who collected all refrences to Yaaz from literature and published a book. Like Vedic ceremoies musical instruments were used in religious rituals; Hittite texts attest to this. Like Vedic Hindus (Narada, Ravana), even priest played harps and lyres. Though lot of muscial instruments were discovered in tombs in Mesoptamia, they were only parts and not intact. But the 4000 year old reconstructed instruments are on display in the museums now. Cylinder seals attest to Platforms on which musicians played. Mesopotamia had two musical systems Akkadian and Sumer. It can be compared to the two main music streams in modern India- Carnatic and Hindustani. The Sumerian system used fixed tunings and prescribed patterns. Akkadian system used seven muscial notes and nine strings. Both have similarities to Indian Ragas and Spata Svaras. This is the summary of my research paper submitted to souvenir in connection with Swami Vipulananda memorial Celebrations in France. Pancha vimsa Brahmana says Sata tantu (hundred string Yaaz or Lyre) was used in MAHA VRATA CEREMONY. taittiriya Samhita (7-5-92), Kataka Samhita (24-5) also refer to this 100 stringed lyre or Yaaz. ‘Taiitiriya Brahmana 3-9-14-1; Satapata Brahmana 13-1-5-1 etc.